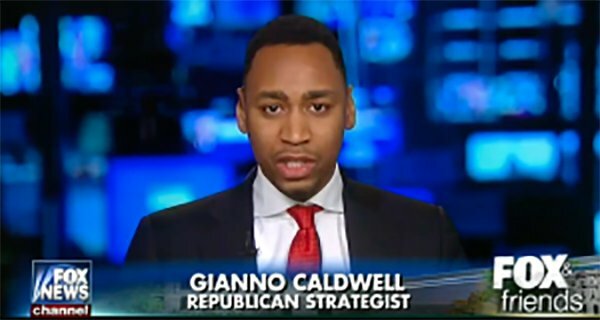 GCU 2010 alum Gianno Caldwell was named this week to the post of Fox News political analyst. Gianno Caldwell’s journey has taken him from an impoverished childhood in Chicago’s South Side, to earning a degree from Grand Canyon University in 2010, and this month, joining Fox News Channel and Fox Business Network as a political analyst. “I am excited to add my voice to the many, many different issues that affect our country on a day-to-day basis,” said Caldwell, founder of Caldwell Strategic Consulting, a public affairs firm in Washington, D.C.
Caldwell had already covered a lot of ground by the time he earned his bachelor’s in psychology in 2010 from GCU’s College of Humanities and Social Sciences. He chose GCU, he said, because it was an established, Christian university with a history dating from 1949. He wanted to study at night and continue working during the day, and GCU was one of the pioneer providers of evening education opportunities. “The environment was very inspiring to me to keep going and push forward beyond obstacles and challenges,” Caldwell said. Caldwell has come a long way. He is the recent recipient of both the 2016 Porsche Power and Red Alert Politics “30 under 30” awards. He has covered red-carpet events for Extra TV, been a guest host on the Armstrong Williams show on Sirius XM radio, and offered political commentary on CNN and other national outlets. On Monday, he spoke on Fox’s Neil Cavuto show about what he described as an attack on Christianity. “There are certainly incremental attempts to pull back the Christian history of our country,” he said. His politics, he said, leans right “100 percent,” but that didn’t stop him from tearing up with sadness on a widely publicized Fox News broadcast about President Trump’s response to the Charlottesville shooting. For Caldwell, 30, the new position is a wonderful opportunity 15 years in the making. It is the result of his hard work, faith in God, courage to take risks and “unyielding” desire to succeed. Born to a mother who he said became a drug addict, Caldwell and his eight siblings were raised by their grandmother on the South Side of Chicago. Things took a turn for the worst when their grandmother was permanently disabled in a car accident. He recalls a childhood of struggle, of periods without light, water and gas. “It was a very unfortunate situation,” Caldwell said. But he also worked periodically for his grandfather’s successful business, Modern Plumbing and Sewage. His grandfather had a large influence on Caldwell’s drive and work ethic. “He was all about work and putting forth effort,” Caldwell said. He volunteered at age 14 for the local alderman. He also has served as government relations director for Naperville Township, legislative liaison to the Illinois state treasurer and interned for Congressman John Shimkus, an Illinois Republican. He worked for the Social Security Administration, the DuPage County Republican party and was an advance staffer on Mitt Romney’s 2012 presidential campaign. A series of hard-fought opportunities brought him to his new job at Fox, and with God’s will, he will continue enhancing his career and forging new paths. He spends time between homes in Washington D.C. and Los Angeles, and is working on several entertainment projects. He said he owes God for all he has gained.